Powered by a 3.5-liter V6, the Toyota Avalon features unspectacular styling and seating for five. It delivers a pleasant ride and good acceleration. For 2009, Toyota has closed the last link in Avalon's comprehensive safety package by making skid-mitigating Vehicle Stability Control (VSC) standard on all models. Active front headrests are also added for 2009. The Toyota Avalon Touring has been canceled due to lack of interest. 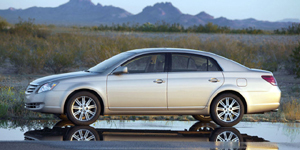 The 2009 Toyota Avalon Sedan is powered by a 3.5-liter V6 with 268 hp. Find the used Toyota Avalon of your choice from a dealer in your area. Search our used car listings now.